There are a lot of stadiums we’re yet to post! 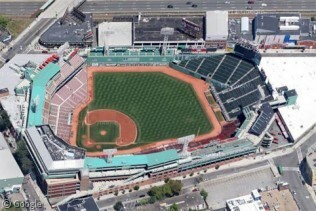 Here’s Fenway Park, where the Boston Red Sox play. man, now you can really appreciate how far manny ramirez hit that home run on April 19 which reached the massachusetts turnpike. Yes, that Ramirez home run was huge. I could be wrong, but I think there is some question whether it really reached the turnpike though. It certainly hit the parking lot and bounced beyond it…but perhaps just onto the tracks between the garage and the turnpike. (see for example: http://www.patriotledger.com/articles/2005/04/21/sports/sports01.txt) No matter what though, it was quite a feat.